Vintage - Poole Pottery Company China Tea/Coffee Set, in the "Twintone" Pattern #C83, 13-Pieces, Circa 1930 to 1942. 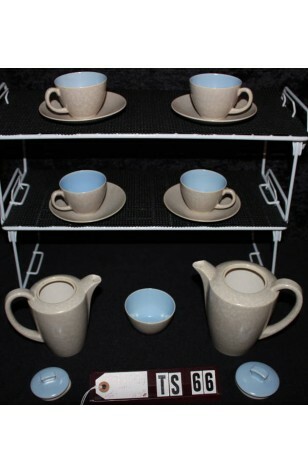 This Vintage Poole Pottery Co "Twintone" Tea/Coffee Set is in the Color Combination #C83. #C83 is a Deep Sky Blue used inside the Tea Cups, and on the Tea Pot and Coffee Pot Lids. The Outside of the items being marbleized look, in Sea Gull Gray. Poole Pottery is Highly Collectible, and there are showing NO signs of chips, wear, or age...Great Resale Condition. 1 - Sugar Bowl - 1 7/8" Tall x 3" Dia.